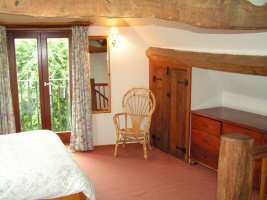 Well Cottage, the smaller of the two self catering holiday cottages at Blackpitt Farm near Stow on the Wold in the Cotswolds, has a lovely warm and snug feeling to it. After a long and tiring drive, it is the type of place any weary traveller could wish to come home to. 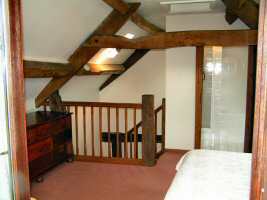 A wealth of wooden beams, cupboards and banisters are a prominent reminder of comfortable rural living. 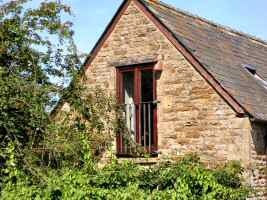 Featuring one double bedroom with an en-suite bathroom upstairs and an open plan kitchen and living accommodation downstairs, Well Cottage makes a great base for your holiday. 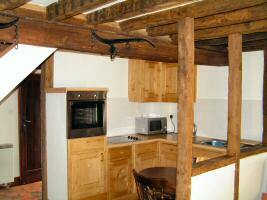 The kitchen at Well Cottage still embodies the original shape of a milking parlour stall. So remind yourself when pouring some milk into your tea that this is where those cows would have stood! The kitchen has country pine fitted units with a quarry tile floor and is fully equipped with electric oven and hob, a microwave, along with toaster, kettle and fridge with freezer compartment and dishwasher. . The kitchen leads on to a comfortable open plan sitting room furnished with comfy sofas as well as a coffee table. The sitting room also has freeview TV and DVD. 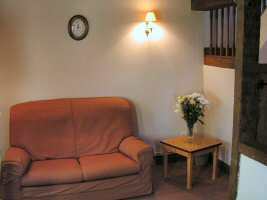 Being in such a secluded environment, you can enjoy many a cosy and peaceful night in reading, playing card games or watching TV, and you are unlikely to be disturbed. Only perhaps by a friendly whinny from the stables. 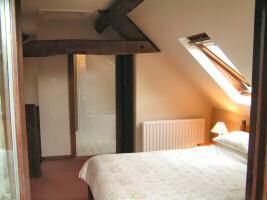 The double bedroom features original beams and French windows. 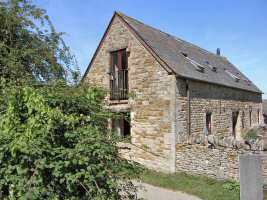 You can wake up in the morning and watch the birds feeding at the South facing window and go to sleep lying in bed watching the stars through the overhead roof light. The en-suite bathroom has toilet, basin, bath and separate shower cubicle.